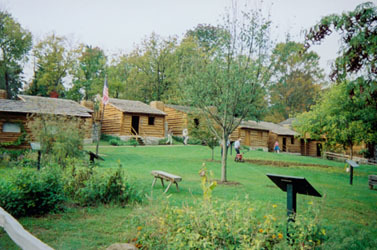 Old Fort Harrod State Park is a reconstruction of the first settlement in Kentucky. The fight to win and keep Kentucky is an essential part of understanding the westward exploration which Meriwether Lewis and William Clark would carry all the way to the Pacific Ocean; it’s also an essential part of Clark family history. Harrodsburg was founded in 1774 by James Harrod, a youthful hunter and frontiersman who was commissioned by Virginia’s royal governor, Lord Dunmore, to survey western land that had been promised as bounty to American soldiers who had fought in the French and Indian War. The territory had been added to the Virginia colony in 1763, when the French had given up all claims to the land south of the Ohio River, and and encompassed Kentucky (often spelled Cane-tuck-ee in those early days) and modern-day West Virginia. Legally, settlers were supposed to wait for advance teams like Harrod’s to blaze the way for new settlements in “Kentucky County.” But hundreds had already decided to take the risk. The result was disastrous. The powerful Shawnee and their allies refused to recognize the British claim on Kentucky as legitimate, and as soon as settlers began to put up log cabins and clear the land, a series of terrible atrocities began. There was nothing “Dances with Wolves” about this war. Instead, the Shawnee showed no mercy. In attack after relentless attack, settlers were slaughtered, their crops and cabins burned, the surviving men tortured to death in wildly imaginative ways, the women and children kidnapped and taken away to live as Indians. 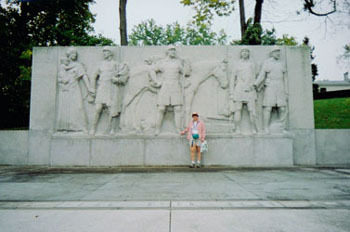 Just as Harrod and and his band of 37 men were staking out “Harrod’s Town,” a message arrived with another one of Dunmore’s rugged explorers, Daniel Boone. Boone (whose own teenage son James was among those who had been taken and tortured to death by the Indians), explained that things had gone from bad to worse. First, several other officially-sanctioned groups bringing down settlers–including one led by 22-year-old George Rogers Clark–had banded together and attempted a retaliatory strike against the Shawnee. Second, and virtually simultaneously, another group had attacked a peaceful hunting party of Mingo Indians and massacred many of the relatives of the Mingo chief, including a pregnant woman. 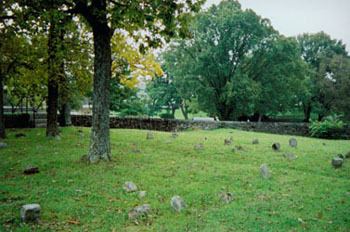 The pioneer cemetery at Fort Harrod. A nearby centograph reads, "To the Wilderness Dead. Those without graves ... unknell'd ... uncoffin'd and unknown"
The outraged Mingos were not prepared to hear distinctions between official and unofficial killing of Indians, and an all-out bloodbath ensued. Dunmore temporarily pulled out attempts at settlement and sent 1100 Virginia militia troops to drive the Indians back across the Ohio River. The operation known as “Lord Dunmore’s War” was successful, and by 1775 Harrod returned with about 50 surveyors and frontiersmen, including two young men who would emerge as leaders along with Harrod, George Rogers Clark and Gabriel Jones. This time, they succeeded in building a fort, laying out a town, and planting a corn crop. It was Clark who was the driving force behind the construction of Fort Harrod. Everyone knew that the peace won by Dunmore’s War could only be temporary, and that the settlers would need a fort to which to run in case of Indian attack. Clark supervised the design and construction of this palisaded fort, which included space for the settlement’s schoolhouse, weaver, basketmaker, and blacksmith. Once inside the fort, settlers could hold out for an indefinite siege. 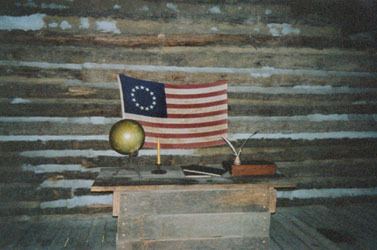 Due to their leadership, Clark and Jones, though both only 23 years old, were elected by the settlers to represent them at the Virginia colonial assembly in Williamsburg. By the time they got there in October 1776, the American Revolution was underway. Some Virginia leaders were prepared to abandon the “backcountry,” but Clark stirringly argued otherwise, declaring that “If a country is not worth protecting, it is not worth claiming.” Clark and Jones persuaded the new revolutionary governor, Patrick Henry, to give them 500 pounds of gunpowder in the defense of Kentucky. Young Jones would be killed in an Indian ambush trying to bring the gunpowder to Harrodsburg. Within months, tiny Fort Harrod was under a desperate siege by Indians with a limitless supply of British backing and support. The conventional wisdom back home held that the West was lost to the fledgling United States. It was clear as British forces entered the continent in force, and the Continental Congress was fleeing from occupied Philadelphia, that no one was coming to the rescue. In an extraordinary act of confidence for someone so young, George Rogers Clark decided to take the responsibility for saving Kentucky upon himself. He knew some military history. He thought he could do it. From one of the corner blockhouses at Fort Harrod, Clark coordinated a network of spies to go throughout the western country (then called “the Illinois”) to gather intelligence on British activities and plans. He then devised a plan by which he believed he could checkmate the British and secure the west for the United States. In a few months, Clark would hit the trail back to Virginia to sell Governor Henry and fellow revolutionary leaders Thomas Jefferson and James Madison on the plan. It all began at Fort Harrod, a great stop for anyone interested in frontier history and how the West was really won. More great pictures of Fort Harrod at Tyler’s Travels. For anyone who does not realize it, this type of writing takes time to research and write, especially to make the writing clear and easy to read. I congratulate “Frances Hunter,” on a wonderful job in preserving history in a fresh, vital, and accurate fashion. Thomas, thank you so much! And knowing the care that you put into your own research, your nice words mean even more. I really appreciate this!